Former Delhi law minister and AAP MLA Somnath Bharti’s wife Lipika Mitra has refused to opt for mediation to settle the attempt to murder and matrimonial violence case filed by her against her husband. The Court then directed the Trial Court to dispose of Mr. Bharti’s bail petition expeditiously. Following this, the Dwarka Court extended Somnath Bharti's judicial custody till October 19. The bench took note of Lipika’s statement and disposed of the MLA's petition saying that it has now become infructuous as the petitioner has already surrendered. During the hearing, the bench asked Lipika's view on the issue of undergoing mediation at the Supreme Court itself. It then asked Vijay Aggarwal, counsel for Bharti, to approach the trial court with a fresh plea seeking regular bail. The bench had decided to issue notice to Bharti’s wife after senior lawyer Gopal Subramaniam, representing Mr. Somnath Bharti, submitted a letter written by him, expressing desire for a reconciliation in the interest of their children. “My client is extremely keen to resolve this matter by way of a mutually acceptable and amicable solution which bring peace and harmony and also greater understanding and to ensure that their children have a bright future”, the letter had said. The 41-year-old AAP lawmaker has been accused of domestic violence and torture by his wife, Lipika, whom he married in 2010. Mitra has also alleged that Bharti tried to kill her and ordered his dog to bite her when she was pregnant. Delhi Police then registered an FIR against Bharti under sections 307 (attempt to murder), 498A (cruelty towards wife), 324 (voluntarily causing hurt by dangerous weapon), 406 (criminal breach of trust), 313 read with 511 (attempt to cause miscarriage without woman’s consent), 420 (cheating) and 506 (criminal intimidation) of IPC. At the outset, Mr. Subramaniam had on October 1 listed a series of alleged violation of criminal procedure code committed by the police and the Magistrate. He said that Bharti had complied with the September 28 undertaking and surrendered before the police the same evening at 10:00 PM, but his arrest has not been correctly shown in the arrest memo. Further, he complained that the legislator was denied meeting with his lawyer till he was produced before the Magistrate and granted police custody. You may read the LiveLaw story here. 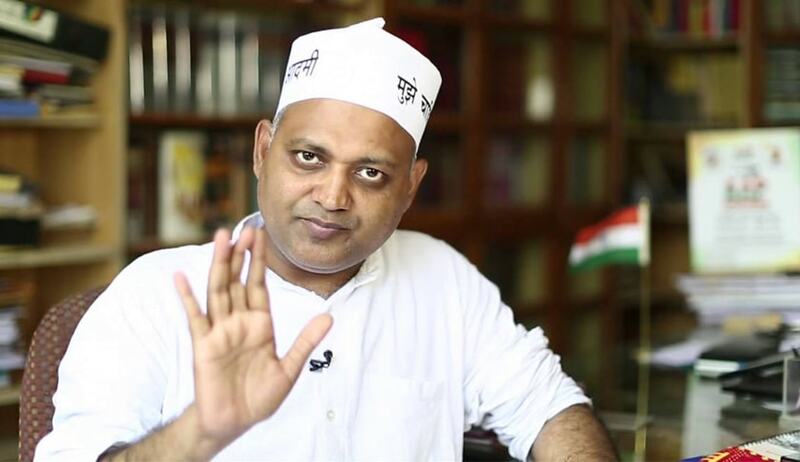 Delhi High Court on September 22, had refused to grant bail to Somnath Bharti, Former Law minister of AAP Government and the present MLA of Delhi assembly, in a complaint filed by his wife accusing him of domestic violence and torture among other allegations. Justice Suresh Kait had then observed that the allegations against him are not bald but supported with documentary proof. The court had also said that Bharti has misused the protection given to him by the High Court. You may read the LiveLaw story here.